If you can't make it to Disneyland this year, but are looking for some good, clean, cheesy entertainment that you can enjoy at any age, you must make a trip to Medieval Times. When I was a newlywed, more than a decade ago, my husband waxed nostalgic about his visit to Medieval Times as a child. He seemed to be aching for another visit, so for a 30th birthday we took the New York City Subway, to NJ Transit, to a taxi cab, to Medieval Times. This was all a surprise, and I am sure he was imaging some fun outdoor adventure or nice dinner. I will never forget the way his eyes lit up when he saw the Medieval Tower with flags flying. He looked at me and said, "are we going to Medieval Times!?!?!" He was so excited and morphed into a 10-year-old-boy once the show began. He yelled "CHARGE" when the knights jousted on their horses. Other fun phrases were "may dishonor rain upon your house! ", "draw near so I might smite thee! ", and "steady your steed, sir, and bring us to victory!" We decided it was time to share this with our children, and so one Sunday afternoon we drove them to that (other) magical place. 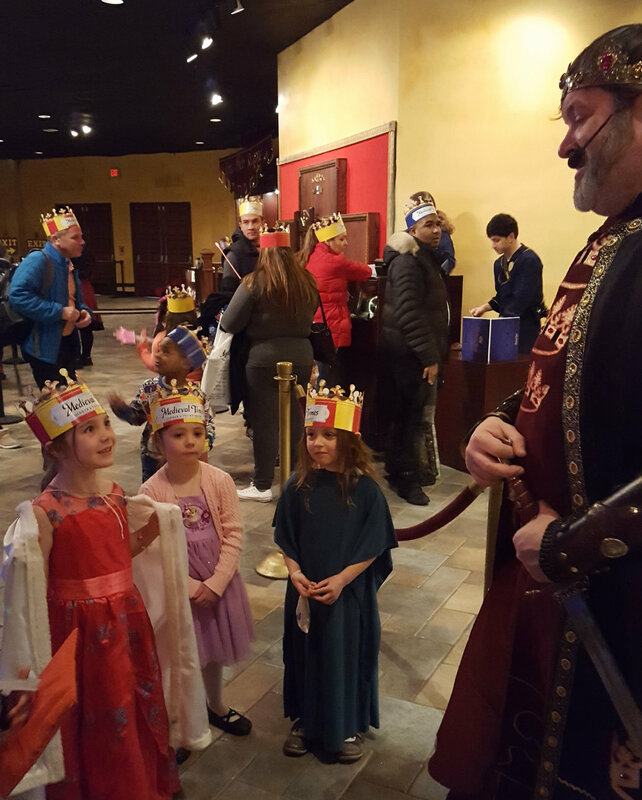 Although the show started at 2:00, we made sure to arrive early so the children could see the various Medieval items on display and to meet the King and Queen. The King will even knight you if you desire. Unfortunately, our children were afraid the King would chop off their head with the sword he was placing on the other children's shoulder, so we stuck with a nice conversation. An added bonus is a fully stocked bar for the adults that includes some decent beers on draft and lots of slushy cocktails expect at a tropical location. Once the show starts, a serving wench (her words, not mine) will serve you food (included in the ticket price) which is actually pretty good. We had tomato bisque, half a roasted chicken and a roasted potato along with corn. For dessert there was pound cake and coffee or tea. They also deliver beers and cocktails. It's mid-millennial heaven. Perhaps the best part was hearing those old phrases come out of my husband's mouth and watching my 6 year old repeat them. Really, she yelled herself hoarse and she's typically pretty reserved. And it is so much cheaper than Disneyland, or would have been if we hadn't blown a tire on the way home.